It is estimated that London needs at least 50,000 new homes to be built every year if the capital is to provide the housing its current population of 8.6 million needs. And if the demand for quality property in Brixton and Battersea that Eden Harper has experienced since the start of 2016 is anything to go by, that estimate of 50,000 new homes is on the low side. The news that Prime Minister David Cameron has announced plans to directly commission the building of more than 13,000 new homes should, therefore, be welcomed. In his New Year message, the Prime Minister said he would “kick-start the building of thousands of homes in a return to 1980s-style projects like the Docklands development”. But only one of construction sites revealed at the start of January is in London. Downing Street says the first wave of directly-commissioned homes, 40% of which will be affordable, will be built later this year in Dover, Chichester, Gosport, Northstowe and near the Crossrail Interchange at Old Oak Common in north-west London. The government has also committed £1.2bn to help developers detoxify brownfield land so it can be used for housebuilding. This will allow 60,000 more homes to be built over the next five years, according to the government. Of those, half will be affordable starter homes. However, David Cameron’s announcement – which he described as “a huge shift in government policy” – will do nothing to increase the supply of homes where there is greatest demand for property and will certainly not affect the supply or value of homes in Brixton or any other area of the capital with an SW postcode. The delivery of about 3,000 homes in Old Oak Common will be welcomed by the buyers who secure one of the houses on offer. But demand for plots on the new-build development is likely to be so intense that it could actually drive up prices in this part of London, which lies between Harlesden and East Acton and is perhaps best known as the site for Queens Park Rangers Football Club’s proposed new stadium. This is certainly the case in Brixton, where demand for rental homes now means landlords can charge an average of £1849 per property each month. As for the plans to directly commission homes in the other four locations announced by the government, we admit to being unaware of Northstowe’s location before a Google search revealed it is a former RAF base five miles north-west of Cambridge. As an independent estate and letting agent, our business model is based on a supply of high quality homes for sale and rent. We, therefore, welcome Communities Secretary Greg Clark’s announcement on BBC Radio Four that the government is “pulling out all the stops to get the country building”. But those homes need to be in the areas of London where demand for homes far exceeds their supply such as Brixton and Battersea, not a new town in Cambridgeshire or a Channel port more than 50 miles from the nearest Tube station or night bus. Brixton’s desirability is easy to understand. It is not only on the tube network, providing convenient transport links to central London, Brixton itself a village within a city with an unrivalled sense of community. That community was swelled by thousands of David Bowie fans earlier this month following the death of the music legend, who was born in Stansfield Road, Brixton. The mural of the Starman singer on Tunstall Road became a magnet for mourners, who placed flowers in front of the artwork before joining an impromptu street party outside The Ritzy. Other landmarks in Brixton include its market, which is open Sundays, Mondays and Tuesdays and featuring over 100 stalls selling fresh produce, jewellery, art and delicious, freshly cooked artisan food. Just around the corner from the market you’ll find Brixton Village, a formerly derelict shopping arcade that has been reborn as a haven for vintage traders, independent food outlets and, during late night Thursday opening, art workshops and live music. 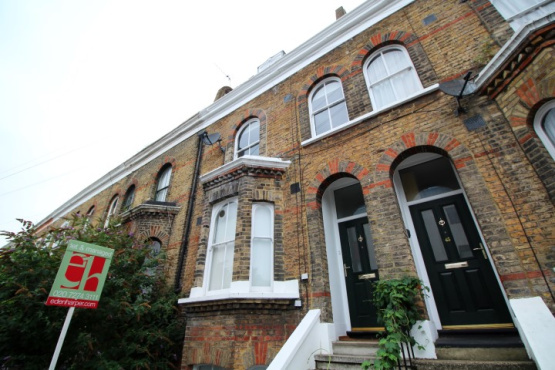 If your sights are set on entering the property market in Brixton or Battersea, contact Eden Harper today. Our local knowledge can help you secure the property of your dreams.